Once we have processed your booking, and taken payment we will send you a confirmation email. Once payment has been processed no refunds will be made unless for the reason stated below. Course places cannot be guaranteed until payments have been cleared. Booking made through our online system require payment at the time of booking. In some case, we are able to invoice companies for training course – please call us on 0844 870 7495 to discuss this. Bank Transfer/BACS can also be made – Contact us for more information. Please note: We do not accept cheques as a form of payment. All courses listed on our website are inclusive of VAT (unless you are a VAT registered company) at the current rate of 20%. 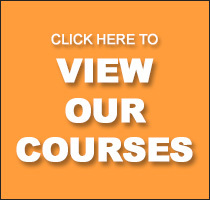 All fees include tuition throughout the course, course work books, examination fees and certificate. Hot and cold drinks are provided. Lunch is not provided unless specified. 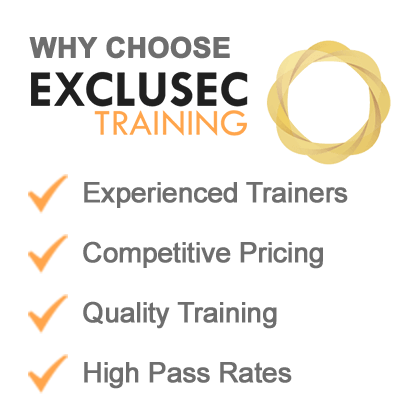 Where any discount is advertised or offered it applies to Exclusec Security Solutions Ltd training courses only. The discount is not available in conjunction with any other offer and places will be subject to availability and exclusively to the terms of the offer at that time. Exclusec Security Solutions Ltd and Highfield Awarding Body for Compliance have measures in place to make reasonable adjustments to all qualifications and assessments, ensuring that learners with special considerations are not disadvantaged. Please notify us in advance using the booking form. You will be sent Joining Instructions prior to starting the course. These include an outline of the day, ID requirements, venue details and any other relevant information. Joining Instructions will be issued approximately 5-7 working days prior to the course. If you have not received your joining instructions three days prior to the training course, please call 0844 870 7495. Exclusec Security Solutions Ltd will not be held responsible for non-receipt of Joining Instructions and refunds will not be issued under such circumstances. All awarding body identification compliance details must be correctly provided on the first day of your course. Any personal identification found to be incorrect may result in your course being cancelled. Some courses involve elements of Physical Intervention and relevant medical conditions will need to be disclosed at the time of booking. There is no charge for transferring your booking to the same course on an alternative date providing that you notify Exclusec Security Solutions Ltd in writing up to 14 days before the start of the course. However, this is subject to availability. However, a transfer fee of 20% of the course fee (plus VAT) will be payable if the notice is received less than 14 days before the start of the original course. No refund will be made in the event of a transfer. No more than one transfer will be allowed per candidate. If you notify Exclusec Security Solutions Ltd in writing (via letter or email) up to 21 days before the start date of a course, you will receive a full refund less an administration fee of 20% (plus VAT) of the course fee. If you cancel your booking for whatever reason within the 21 day period, no refund will be offered and the full course fee will remain payable. Once you have booked and paid for your course, other than the terms above, refunds will not be allowed. If you fail to attend the course on which you are booked and have not given prior notice to Exclusec Security Solutions Ltd then the full course fee will remain payable and no transfer or refund will be offered under any circumstances. Where circumstances dictate, Exclusec Security Solutions Ltd reserves the right to alter published courses, trainers, fees or venues without prior notice. In the unlikely event of a course being cancelled, a refund of the course fee will be made but no compensation will be paid for any additional costs incurred. Details of the specific venue and its location will be sent to candidate in our Joining Instructions for all training courses. Although there is no formal dress code, most candidates choose to wear loose, smart casual clothing. Due to variable temperatures layers are advised. Exclusec Security Solutions Ltd does not accept responsibility for anyone acting as a result of information or views expressed on its training courses including course material. Any opinions expressed are those of individual trainers and not necessarily those of Exclusec Security Solutions Ltd.
Exclusec Security Solutions Ltd does not accept or tolerate verbal or physical abuse towards any of its directors, officers or staff. Exclusec Security Solutions Ltd reserves to right to refuse training or support to anyone they deem to be acting in an abusive or aggressive manner. In these cases, no refund will be offered.